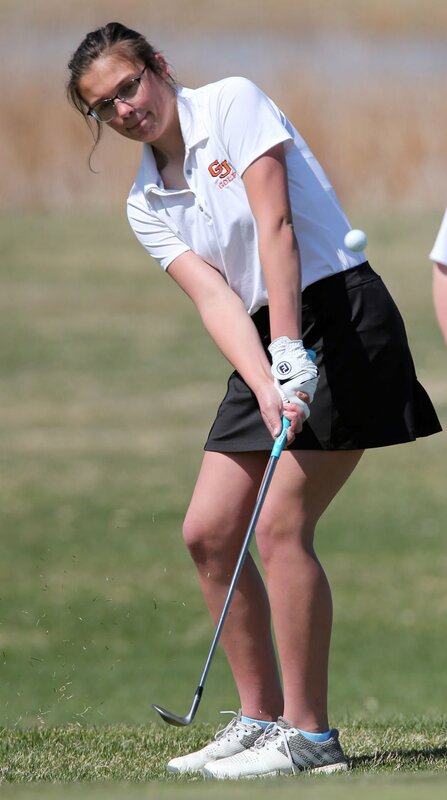 Grand Junction High School's Brittlynn O'Dell hits a chip shot onto the No. 2 green at Lincoln Park Golf Course Monday afternoon. To the right, Kathi Norell from Palisade High School hits her tee shot off the No. 2 tee box. Grand Junction put together a strong team effort to win the Palisade Invitational at Lincoln Park Golf Course on Monday. Playing a "best ball" format, the Tigers shot a team 64 for 18 holes to win by four strokes. Eagle Valley was second with a 68 and there was a three-way tie for third with Palisade, Fruita Monument and Vail Mountain all scoring a 72. The Tigers were led by sophomore Brittlynn O'Dell, who is a returning Class 5A state qualifier. As a freshman, O'Dell placed 16th at state with a two-day total 162. She was the best Grand Junction finisher, one stroke ahead of Gracie Olkowski, who transferred to the Las Vegas area this summer. Grand Junction's winning team on Monday was made up of O'Dell, Jenna Greenlee, Marisol Vendegna, Sierra Schneiter and Maya Bass. Palisade's five-person team was Kathi Norell, Jesse Mello, Kayla Keith, Makenna Shaw and Chloe Schader. The Wildcats' team was Rheanna DeCrow, Madison Mascarenas, Brooke Burkey, Lexie Schafer and Paige Simanson. Area teams are back in action today at Tiara Rado Golf Course for the Warrior Invitational.